Hose clamps are very important components in a car but they can be very difficult to remove when you want to change the different hoses that they secure in place inside the hood. However, with a hose clamp plier, the task of opening up such a clamp is much easier and takes very little effort. Some even have locking mechanisms that keep the clamp in an open position so that you can have an easier time carrying out the maintenance. There are different types of these pliers though, and it would be a good idea if you know the features of each and how each one is designed to work. For this reason, we have compiled this list of the best hose clamp pliers that you can get in the market and our goal is to make it easier for you to pick the one that suits your needs. If you are interested in buying a single piece hose clamp plier, then Astro’s 9409A is a good option to consider. The piece is designed for the removal of plastic or metallic self-tightening hose clamps and is adjustable so as to accommodate 11/16 – 2.5-inch diameter units. With a cable design, the plier has a precision clamp at the end of the line that gives you extended reach. This is further enhanced by the flexible cable assembly, which lets you curve it to get to the hidden hose clamps under the hood. Once contact is made, the 9409A can be locked in place so that you can free your hands and take off the hose clamp quickly and easily. This is made possible by its re-engineered double gear lock lever, which has wider and deeper gears for secure locking. 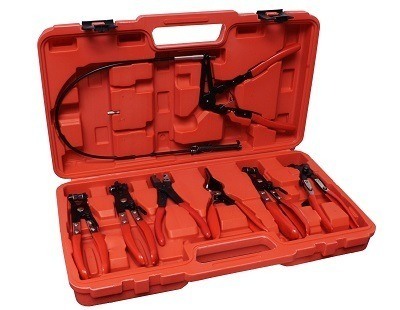 With 9 pieces, this product stands out as the best collection of hose clamp pliers, containing 7 hose clamp pliers, a double head screwdriver (cross and flat head that are interchangeable by pulling the metal part) and a hose removal hook. All of these components are conveniently packed in a compact carrying case with a molded toolset that holds them firmly and organizes the kit. This makes it easily portable when going on site or when moving them back to storage. Diving into the specifics, the 7 pliers include a flexible cable hose clamp plier, a pair of swivel jaw pliers that maintains its bite even if you rotate the hose clamp, 45° curved pliers with locking function, cross slotted jaw pliers and hose remover pliers. Combined, the kit is suitable for working on hidden areas, with the flexible cable plier being particularly useful for providing long reach. In such instances, the ideal uses include the replacement of oil, water, and fuel clamps as well as hoses. 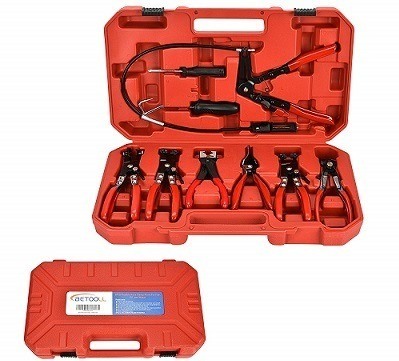 Astro Pneumatic Tool Company is well known for making high-quality car tools and their 9406-hose clamp plier set is no different. Though expensive, this product contains 7 pliers, with each one having a different design to carry out a different task. 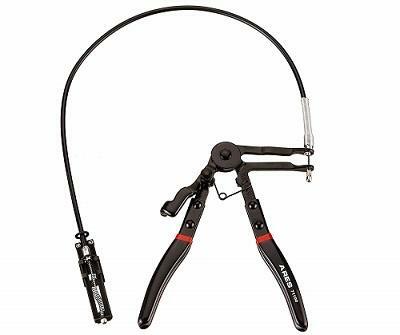 The main component is the flexible cable plier that gives you extended reach when removing plastic or metal hose clamps with diameters of 11/16 to 2.5 inches. This plier can be locked into position, freeing up your hands in the process. 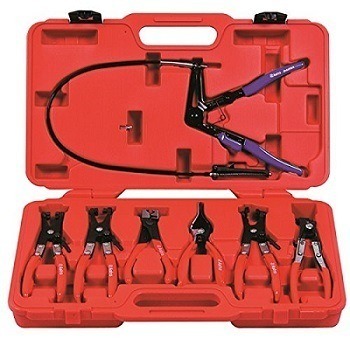 Other pieces in the set include swivel jaw hose clamp pliers, angled flat band hose clamp pliers, hose remover pliers, collar pliers, and flat band hose clamp pliers. All of them have dipped plastic handles that are comfortable and give you a good hold. A blow molding case is also included as part of the package for organized storage and easy transportation. Even though this model 250 A from Knipex does not have a flexible cable, it has another big advantage on its side and that is adjustability. The unit has a quick set adjustment push button that gives you a maximum clamping capacity of 70mm (roughly 2.8 inches) and more than 40mm (about 1.6 inches) in clamping range, which means you can untighten quite a wide variety of hose clamps. These include standard, space-saving, and spring wire and spring band hose clamps, and it has a lockable feature that lets you leave the clamp open for hands-free use so that you can focus on doing other things. Another key feature is the rotating jaw inserts, which give you a universal and reliable grip in all positions under load while a slim and narrow head design makes it ideal to use in confined spaces. 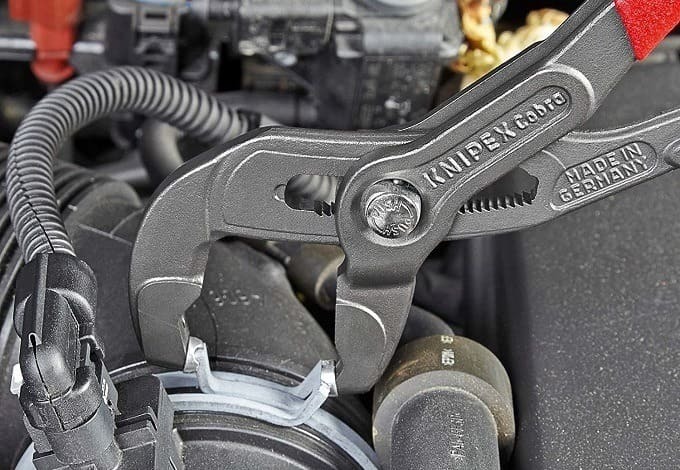 EWK’s hose clamp plier is a flat band type that is specially designed for use in VW, Audi, BMW, and Mercedes Benz cars, and more specifically for locking and unlocking type clic and clic-R clamps at a maximum opening of 1.85 inches. This locking/ unlocking or installation/ removal of clamps is made possible by specially designed jaws that allow a quick change between the two functionalities by simply turning over the pliers. Chrome Vanadium is used to make this product and it makes the entire piece very strong and durable. On the downside, the plier is not lockable but it has PVC dipped handles that make them more comfortable to hold while also providing better grip. If you are on a tight budget, TruBuilt 1 Automotive’s hose clamp plier is a good piece to consider. That said, this does mean that the product is substandard. The plier actually has a tough and durable carbon steel construction, with grippy handles that are double dipped in rubber for comfort and easy use in removing heavy duty hose clamps. Even though it has a relatively small max opening of 1.75 inches, this product is suitable for removing most ring type and flat band hose clamps as well as to install them back. Other features include swivel jaws for continuous grip even as you move the load and a locking function for hands-free use once the jaws are pressed into action. With a long 24-inch, heavy-duty cable, Ares’ 71100 flexible hose clamp plier is designed to have an extended reach where other non-cabled pliers cannot get to. This means that the piece allows you to remove plastic or metal self-tightening hose clamps that are deeply hidden inside the hood. While doing so, the unit has a precision clamp at the end of the cable that is capable of removing clamps having a diameter of 18 – 54mm (11/16 – 2.5 inches), which is quite a wide range. Apart from the flexible cable and precision clamp, a locking mechanism is also built-in for additional flexibility, and it is designed to hold the hose clamp in the open position for hands-free operation as you remove or install it. For a flat band hose clamp plier, this 3977 from GearWrench is equipped with thick handles that make its use much more comfortable. The handles are actually double-dipped, which gives them that extra layer for comfortable holding. A 25% thicker gauge steel is used to build the entire unit, making it strong enough to force hose clamps open without bending, while improved spring mechanisms give it long-lasting performance. The jaws of the 3977 are angled at 45° so as to give improved access around obstacles and they have swivel tips for gripping onto the load from any angle while a locking mechanism holds them in place for hands-free use. If you are looking for a hose clamp plier kit that is affordable, then you should consider this set from ABN. Even though a screwdriver and a hose removal hook are not included, you get a 7-piece set that includes flexible cable clamp pliers, swivel jaw pliers with a slot and another without a slot, flat band hose clamp pliers, hose remover, clic-r collar, and hose clamp pliers. With all these, you can easily get to the hard-to-reach hose clamps in confined areas inside the hood. Once in use, most of these units have a locking mechanism that keeps the hose clamp stuck in an open position for easy use. Other features include double-dipped comfort grip handles and a blow molded case for organized storage and easy transportation. HFS’ hose clamp plier is quite affordable and it offers you the most flexibility when it comes to extended reach because it has a 630mm (roughly 25-inch) cable, which is quite long. This gives you access to those awkwardly positioned tag type hose clips that can be very difficult to reach using normal pliers. 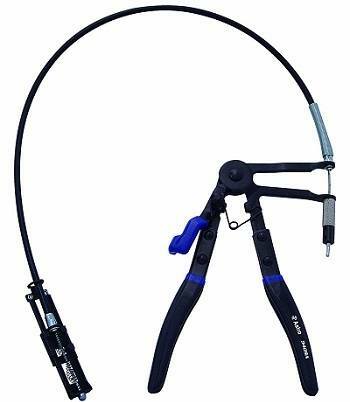 At the end of the cable is a precision clamp that is specially designed to grab onto the hose clamps on fuel, water, and oil hoses so as to make any necessary replacements. Instead of the regular locking mechanism found in other units, this one has a ratchet action, which means that it locks itself into position the more you press and release it. The handles are vinyl dipped, giving you comfort and grip as you bite more into the hose clamp. There are hose clamp pliers that have flexible cables and there are those that are cableless. Flexible cable pliers have an advantage over the others when it comes to reach. Their cables are equipped with precision clamps at the end, which give an extended reach so that you can easily access the hidden hose clamps under the hood. Therefore, when you buy a set, ensure that a flexible plier is included. If you buy a single piece that does not have this feature, then you may soon discover its importance the more you carry out maintenance work on cars. This factor is important to consider because of the different sizes of hose clamps. Most pliers can accommodate hose clamp diameters that are between 11/16 and 2.5 inches, which covers the most common sizes as well as the max opening for most pieces (2.5 inches). However, if you get a pair of pliers with a wider range and a larger max opening, the better because it can be used on a whole lot more variety of hose clamps. A locking mechanism basically enables the plier to keep the clamp in the open position on its own. This gives you the convenience of leaving your hands free to pull out the hose or do other things. The mechanism also reduces the strain of continuously pressing the handles, which can be a difficult task. Therefore, it is best to have this feature for convenience and ease of use. The material used to make this product directly affects its quality. Facing a lot of resistance when opening up the hose clamp, a weak pair of pliers can easily bend or get deformed. You should ensure that the product is made using a tough metal such as carbon steel, chromium vanadium, etc. if you want a pair of pliers that will last. Since the pressing action or compression of the handles takes some effort, it would be wise to have some comfortable and grippy handles so that the pressing doesn’t hurt your hands. For this reason, check for features such as dual dipped plastic or rubber handles. 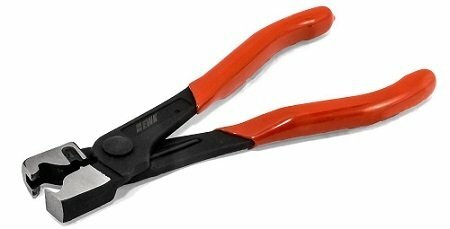 There are different types of hose clamp pliers and each one is specifically suited for a particular range of tasks. Some are even designed for use in specific vehicle brands because the hose clamps inside are a bit unique. This means that before buying any pair of pliers, ensure you know the type(s) of hose clamps your car has, then select the appropriate piece to unlock them. 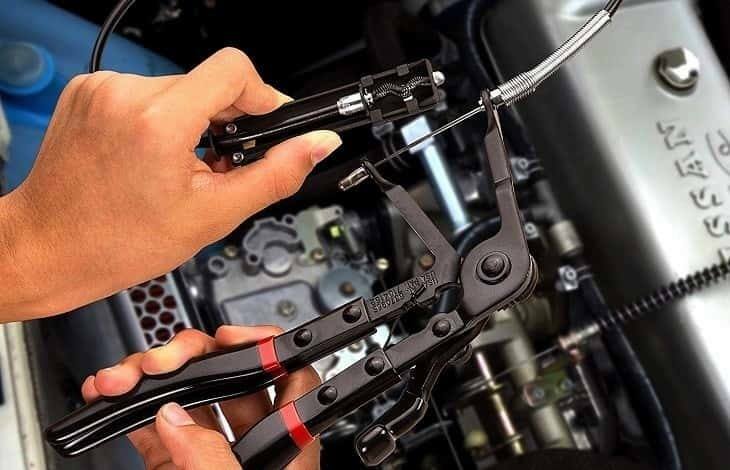 In conclusion, hose clamp pliers are essential tools when it comes to car repair/ maintenance and should be in your arsenal whether you are a mechanic or you like to take care of your own vehicles. 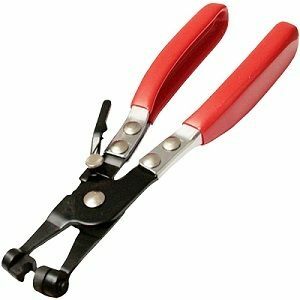 Our hope is that after going through the hose clamp plier review above, it should be easier for you to pick the best hose clamp plier that suits your needs.